Rules Guy: How close to the fringe can a hole be cut? Rules Guy: How close to the fringe can a hole be cut and still be legal? 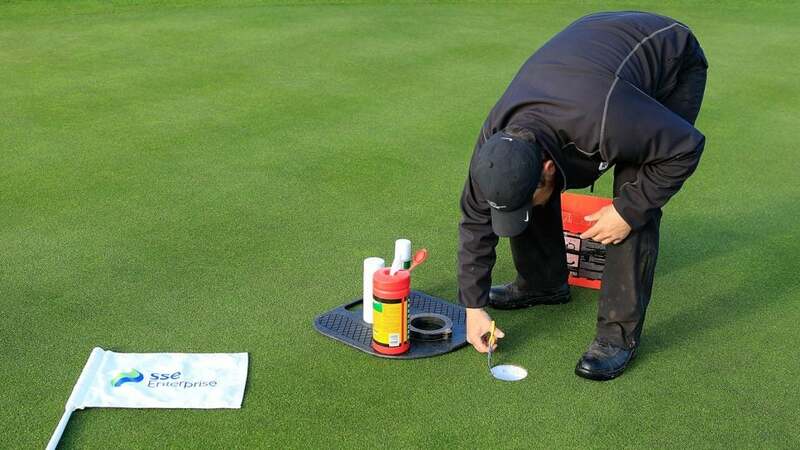 A greenkeeper puts the finishing touches on a newly cut hole prior to the first round of the 2016 SSE Enterprise Wales Senior Open. The Rules of Golf are tricky! Thankfully, we’ve got the guru. Our Rules Guy knows the book front to back. Got a question? He’s got all the answers. How close to the fringe can a cup be positioned and still be legal? —BRUCE E. BROWN, VIA E-MAIL That depends entirely on the severity of the superintendent’s hangover. Seriously, though, there is nothing in the Rules of Golf about hole location, so there’s no such thing as an “illegal” hole location. The USGA publication “How to Conduct a Competition” does, however, recommend that hole locations be at least four paces from the edge of the putting green; the PGA Tour informs Rules Guy that it does likewise. Closer than that and the hole has clearly joined the lunatic fringe. Got a rules question? Of course you do! Whatever it may be, send yours to [email protected] and the question may be answered in an upcoming issue of GOLF. Until then, play by the Rules!